I’m finally making the Hap Blanket, by Ysolda Teague. 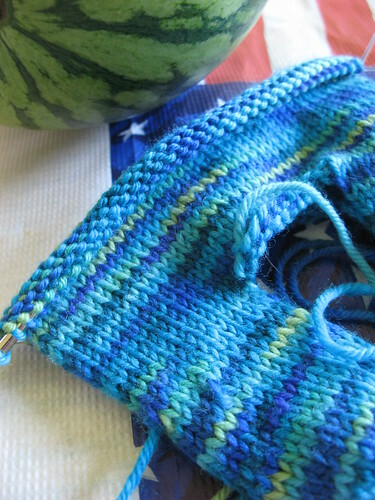 It’s knitting up super quick, which is good because I need to finish it and gift wrap it by this Saturday. I hope they like it!! I find it difficult to pick out colors for other people and, so far the center square is reading a little… mexican poncho-ish. Not quite what I was going for. What the photo doesn’t show is that I’ve started the edges and it’s looking much more worthy of a gift now. I can’t wait to see it all unfolded. This is one of those projects that stays in a blobby mess until it’s all bound off and allowed to spread out. 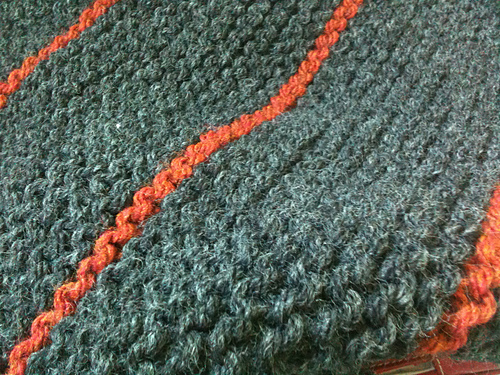 I am very pleased with the Lion Brand Wool-Ease Chunky yarn so far. It’s very soft, and will hopefully be very durable too. If you read my blog, you’ll know that I’m, admittedly, a bit of a yarn snob. So, I was a bit skeptical about the acrylic blend of Lion Brand. 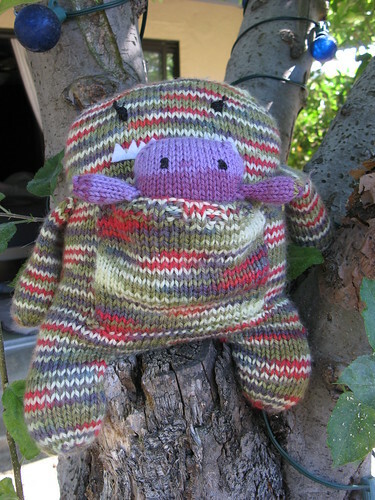 But, I figure it will be machine washable which is always a nice feature for a hand-knit gift, just in case the recipient isn’t familiar with the delicate nature of wool and alpaca. I suppose this would make a nice felted discloth if it was 100% wool and thrown in the washer and dryer though! Playful Stripes by Never Not Knitting – she has so many cute little girl clothes I want to do eventually. Check out her most recent blog post with a baby shoot, how cute, right?! I also really want to design something… but alas, there is so little time in the day. Hopefully I’ll get around to it very very soon! 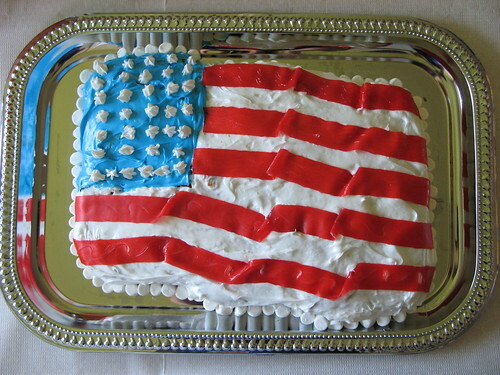 This is my attempt at a waving flag cake. I saw this on a parenting.com newsletter and had to try it. I only get this crafty when I’m pregnant. This cake project was kid friendly and much less involved than the sugar cookie phase I went through with my son. 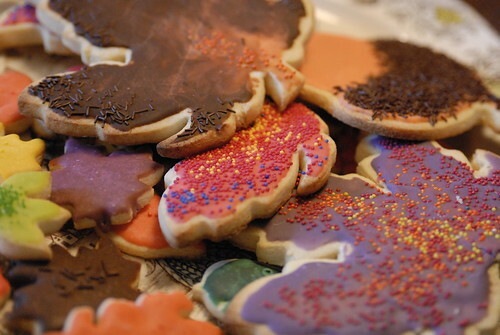 When I was pregnant with him 4 years ago I ended up making these elaborate sugar cookies for Thanksgiving in all kinds of different leaf shapes with gorgeous autumn colors, puprle, forest green, gold, yellow etc. The funny part is that I bought all these cookie shapes and have yet to make sugar cookies since that first pregnancy! 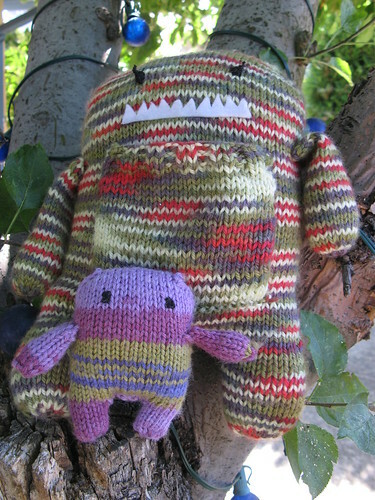 I’m hoping to get some more work done on the Grammy Monster (picture below). Happy 4th of July everyone!